Daily Illuminator: Mix-Up Your Game Night With Muertoons! September 26, 2017: Mix-Up Your Game Night With Muertoons! Has the first temperature drop inspired you to take out your cozy hoodie, turn your coffeemaker on, and start planning your costume? Are you getting excited about Halloween? How about getting a jump on all things spooky with Muertoons? In this game, you and up to four friends are in Muertown looking for the Dia de los Muertos celebration. Tio Rico, the neighborhood grump, hates the noise and lights of the party, so he stole the signs pointing the way! 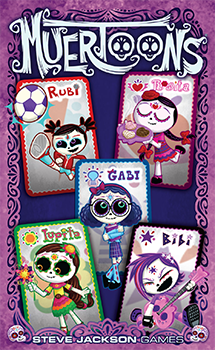 But you're in luck, because Rosita, Bibi, Rubi, Gabi, and Lupita have dropped a trail for you to follow. The first person to play all their numbered cards makes it to the shindig and wins! This quick, easy-to-play card game includes instruction cards for each player that make it a breeze to follow the right card order as you familiarize yourself with the rules. The illustrations, based on Muertoons, the animated series, are fun, vibrant, and perfectly festive. Muertoons is entertaining and easy to carry - a great game to keep multiple copies of, if you work in a classroom. So if you want to collect games to prepare for cooler weather and spooky happenings, pick up Muertoons at your local game store, or on Warehouse 23 today!